Best Lake Michigan Family Fishing And Vacation! The best spot on Lake Michigan to take your family fishing and on vacation is Sheboygan, Wisconsin! With world class salmon and trout fishing, world class golf, world class road racing, a marina, lakeshore resort, lakeshore camping, beaches, piers, river boardwalk, indoor water park, shopping and restaurants, Sheboygan offers the best in family vacationing. 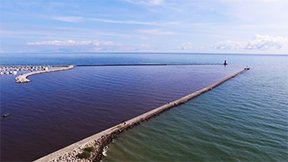 Sheboygan offers unprecedented lake fishing access on two large piers with public parking, public restrooms and fish cleaning stations at the mouth of the mighty, Sheboygan River. For those with a boat, Sheboygan has a large marina and river docks for parking boats, or for slip rentals over the summer, and two marine gas stations for fuel. The Sheboygan marina also has an excellent public boat launch with plenty of parking space, public restrooms and a fish cleaning station. The port of Sheboygan is also home to a fleet of charter fishing boats, available for half day or full day Lake Michigan trout and salmon fishing. A full service fishing experience that families will remember for a lifetime! Sheboygan has accommodations for every family budget! 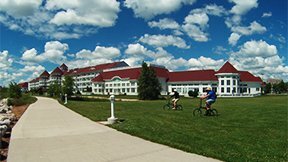 The beautiful Blue Harbor Resort located on the majestic shore of Lake Michigan, and at the center of Sheboygan's lakeshore and riverfront activities, has a spa for the ladies, indoor water park for the kids and lake view restaurants for the whole family. You can step out the door and fish on South Pier, or go to your chartered fishing boat. There are middle to lower priced hotels or you can stay at a Bed and Breakfast. Some offer suites, a swimming pool or restaurant. All, are a short drive to the lakefront to fish. For families that want to camp and fish, Kohler-Andrae State Park is a short drive south of Sheboygan, on Lake Michigan's shore. Fishing of course! But there's lots of other activities to keep the whole family entertained. 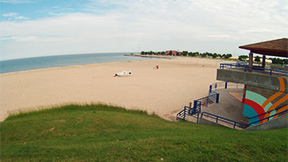 The family can hangout at Sheboygan's sandy North Beach and fish the North Pier. The ladies can catch some sun, the guy's can fish on North Pier, and the kids can go back and forth from swimming, playing on the beach and fishing. There's public restrooms, showers, volleyball nets, a playground and a large grassy area for kite flying. Explore and enjoy Sheboygan's lakeshore with Segway tours, bike rentals, kayak rentals, SUP (stand-up paddle board) rentals, surfboard rentals, sailboat rentals and fishing pole rentals available for family fun! Take an exhilarating walk along Sheboygan's many miles of inspiring lakeshore, beautiful river boardwalk and long piers, breathing in the refreshing, fresh water scented air of Lake Michigan. 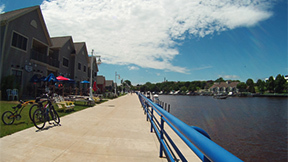 Sheboygan's river boardwalk is a wonderful area for a walk and has the Blue Harbor Resort, Harbor Winds Hotel, shopping, beauty salon's, restaurants, hot dog stand, ice cream parlor, coffee shop, pubs, kayak rentals, bike rentals, miniature golf, bait shops, charter boats and South Pier fish cleaning station. Be sure to check out the fish cleaning station when the charter boats come back to port to see the big fish that were caught! See the old world charm of Sheboygan's original downtown, 8th Street. A short walk north up 8th Street from the South Pier District's roundabout and river boardwalk's 8th Street bridge river crossing. There's hotels, shopping, restaurants and bars. Take the kids to Blue Harbor Resort's indoor water park. You can get a pass just for the water park, you don't have to be a guest at the resort. 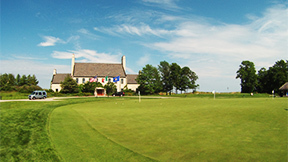 Play a round of world class golf at one of the many Sheboygan area golf courses. World class golf courses like The Bull or Whistling Straits! Play a round of 18 holes of world class Frisbee Disc golf at Sheboygan's, magnificent Vollrath Park. It's just a short walk north up the shoreline from North Beach. There's charcoal grills, public restrooms and a disc store. Best of all it's free! 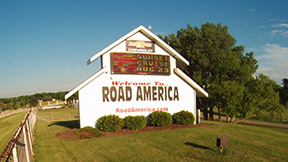 Watch world class super bike and auto racing at one of America's finest road racing courses, Road America! It's just a short 30 minute drive from Sheboygan through the Midwest's picturesque farming heartland. 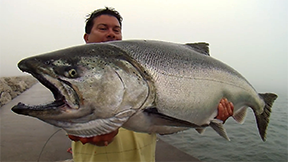 Looking for a great scale to weigh your fish? Tired of replacing batteries? I was and bought the Weston 50lb. spring and hook scale for my salmon and trout! It also comes in 20lbs. and can be certified.